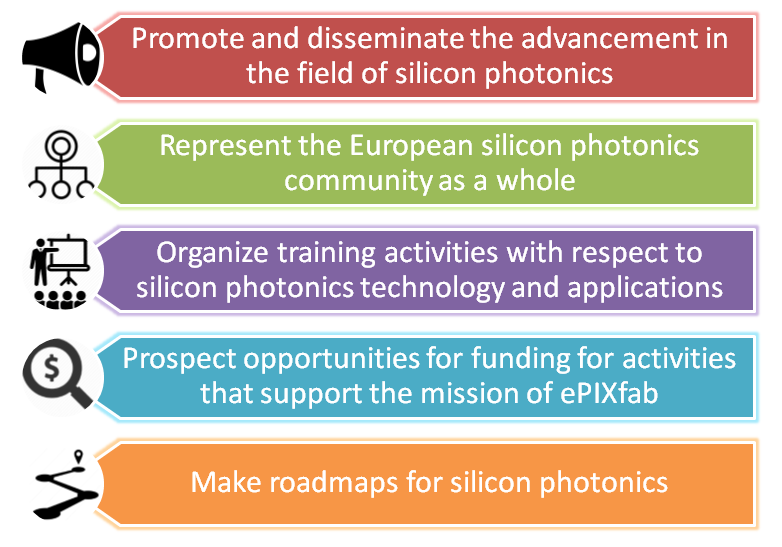 ePIXfab is a European alliance of organizations that promotes silicon photonics science, technology, and applications. ePIXfab is an open alliance. Any European organization with an interest in the mission of ePIXfab is welcome to become a member. Since 2006, ePIXfab has set up an access to Multi-Project Wafer (MPW) service for photonic IC prototyping, packaging and training. To know more read history and rationale of ePIXfab. Since 2015, ePIXfab has transferred the MPW services to EUROPRACTICE. However, ePIXfab will continue to serve its role of being an alliance of European institutes working in the field of silicon photonics. 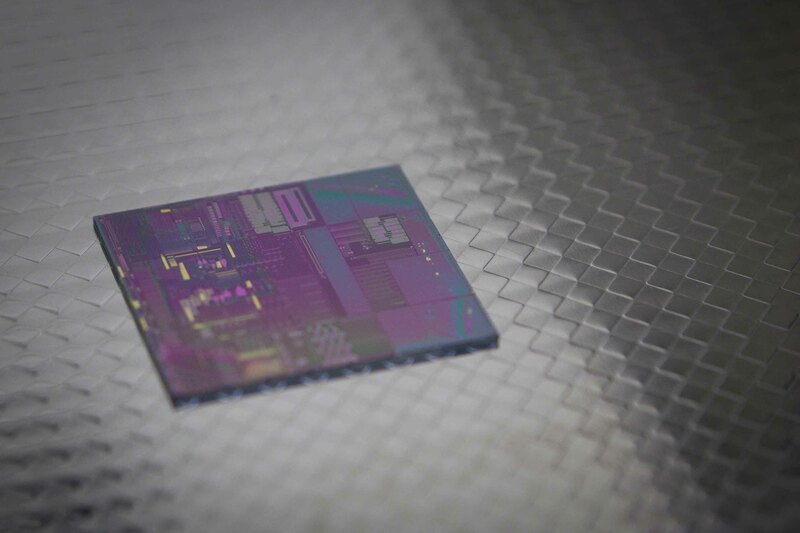 The mission of ePIXfab is to build a future for silicon photonics in Europe through the development of a fabless model for the fabrication of silicon photonic circuits based on existing CMOS labs and commercial foundries relying on European know-how. ePIXfab is an open alliance in which any European organization with an interest in the mission of ePIXfab is welcome. ePIXfab respects neutrality with respect to the ambitions of the member organizations and never expresses an opinion about the capabilities of its members. Silicon has become more and more important as a material for integrated photonics. Silicon-on-Insulator has become a material of choice for passive photonic integrated circuits. Recent advances in the field have even pushed Silicon beyond its passive niche, with demonstrations of high-speed Silicon based modulators, Silicon/Germanium detectors, and even light sources. The fact that today’s commercial electronics are based on the same material can be used a leverage for the development of Silicon photonics. The VLSI of CMOS has established a huge technology base for mass-fabrication of Silicon-based electronic circuits with submicron features. Many of these processes can be applied directly or in a slightly modified form to photonics to fabricate photonic circuits in silicon-on-insulator (SOI). 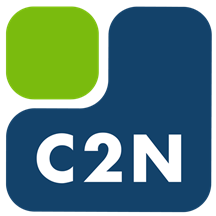 Compatibility with CMOS technology is very important when considering possible large-volume manufacturability as well as integration with electronics. A platform is needed to push this technology transfer and make it available to projects and activities within and outside ePIXnet. 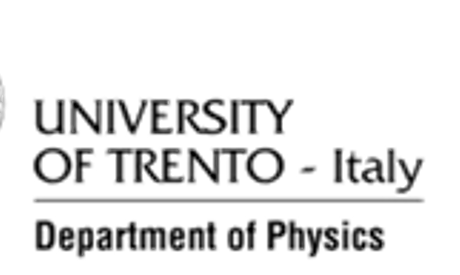 This platform should support the creation of silicon photonic devices from design to fabricated product, using medium- to high-volume fabrication techniques, and thus facilitate research in a variety of fields linked to silicon photonics, such as hybridization, biophotonics, sensing, and telecommunications. In the future, this should ease the transition of silicon photonic components from research to market because fabrication processes should in the end be transferable to commercial CMOS foundries. ePIXfab started as a collaboration between imec (Belgium) and CEA-LETI (France) to realize the Silicon Photonics Platform within the framework of ePIXnet, the FP6 Network of Excellence on photonic integrated components and circuits. The silicon platform was one of six technology platforms in ePIXnet (the others were the InP platform JePPIX, the nanostructuring platform NanoPIX, the packaging platform ePIXpack, a high-speed test platform and a high-performance computing platform). From 2012-2015, ePIXfab today became a consortium of 7 partners within the framework of the EU FP7 project – ESSenTIAL. During this project, the activities were broadened to a wider series of services that support the supply chain for silicon photonics, including variants of the silicon photonics technology and packaging services for silicon photonics. To this end the ePIXfab partnership was extended with IHP, VTT, TNO, and Tyndall Institute. In 2011, ePIXfab started a collaboration with Europractice IC service. In 2015 the MPW services provided by ePIXfab were completely transferred to Europractice IC service. Before this transfer ePIXfab had successfully completed 50 MPW runs. Today when the MPW services are completely transferred to Europractice, ePIXfab will continue to devote itself to its much broader role of representing the European silicon photonics community. ePIXfab has now become an open alliance of organizations that promote the science, technology and application of silicon photonics. The core activity of ePIXfab will be the promotion of the science and technology of silicon photonics by organizing training and workshops.